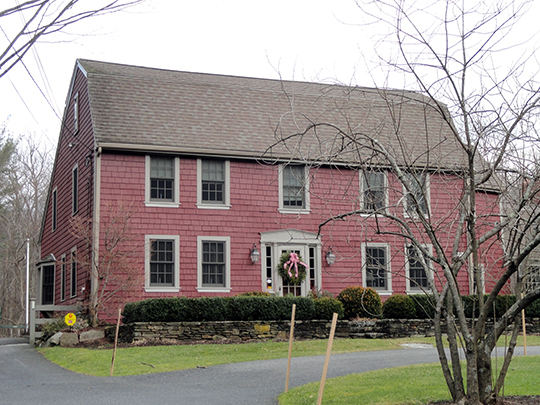 Sherborn Town Hall is located at 19 Washington Street, Sherborn, MA 01770; phone: 508-651-7853. Photo: Richard Sanger III House, ca. 1734, Sherborn, MA. Listed on the National Register of Historic Places in 1986. Photographed by User:Daderot (own work), 2006, [cc-by-3.0 (creativecommons.org/licenses/by/3.0)], via Wikimedia Commons, accessed July, 2013. Elizabeth Friedberg, Massachusetts Historical Commission and Edward Gordon, Sherborn Historical Commission, Sherborn Multiple Resource Area, nomination document, 1985, National Park Service, National Register of Historic Places, Washington, D.C.